A screen grab of a since deleted tweet. 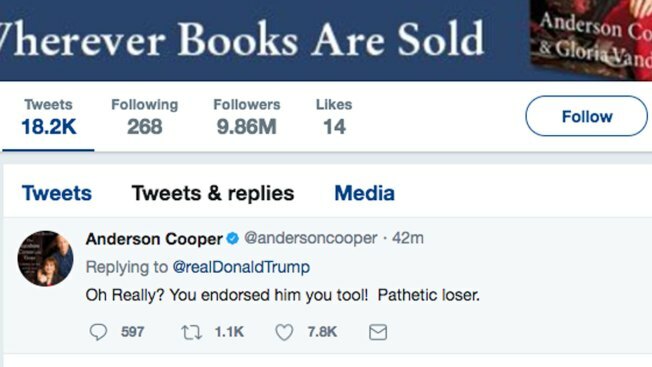 CNN's Anderson Cooper said Wednesday that someone had "gained access" to his Twitter account and sent out a tweet calling President Donald Trump a "pathetic loser." The taunt from Cooper's verified account came after Trump had tweeted in the wake of Doug Jones' projected win in Alabama's Senate election. Trump noted that he had first backed Roy Moore's primary opponent, Luther Strange. "Oh Really? You endorsed him you tool! Pathetic loser," Cooper's Twitter account replied. Cooper later posted that he "just woke up to find out someone gained access to my twitter account" and was investigating. Until Wednesday, no messages had been posted to his account since Sunday.